The next meeting of the Club Executive is on Wednesday 1st October 2014 at 8pm in the GAA offices in Pearse Park. Thank you to all who supported the recycling drive on Saturday the 28th of September! It was a great success! AGB have been chosen to take part in the Tesco Arklow Community Fund. Please collect a ‘Tesco Community Fund Token’ with every shop and deposit in the AGB cylinder. The AGB cylinder is currently awaiting your tokens in Tesco and will be over the next 5 weeks! Please support! 1st Prize: Sean O’ Farrell, Arklow who won 2 All-Ireland tickets plus €100 and an overnight stay in the Croke Park Hotel. 2nd Prize: Gerry Pender, Aughrim, won a €100 Bridgewater shopping voucher. 3rd Prize: Jim O’Connell, Arklow, winner of a Hand-painted Reading Lamp. 4th Prize: Michael Murphy, Wicklow Town, won a His-and-Hers Gift Set. Arklow Positive Ageing Week is scheduled for the 1st October – 11th October. There will be a Schools Blitz on Tuesday the 7th October as part of this week of events. For more details see: Positive Ageing Week 2014 at www.ageaction.ie. 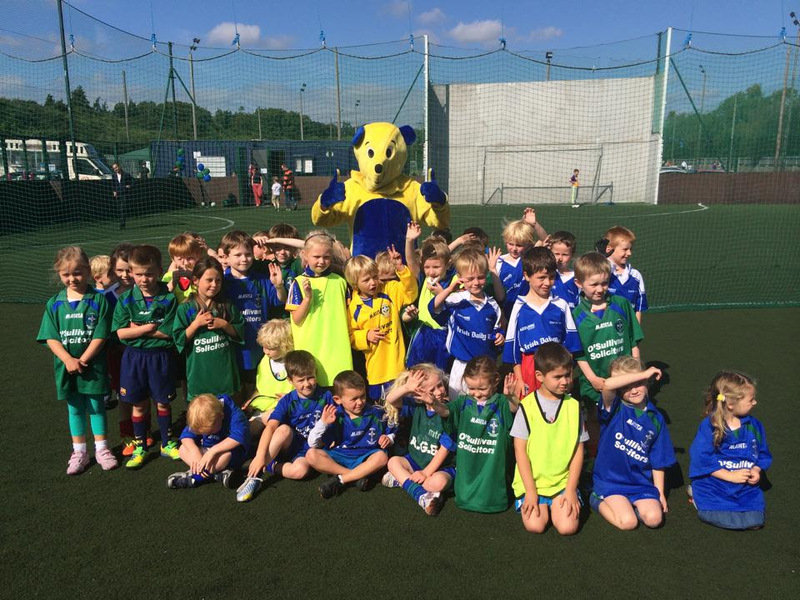 Wicklow are starting an Award 1 (child u6-u12) Coaching Course on Sat Oct 18th in Ballinkill from 9am-4pm. Also an Award 1 Coaching course (youth/adult, U12 plus) on Sat the 24th of Sept from 9am-4pm. Cost covered by club. A great opportunity to learn more about coaching. Places are booking fast. Contact your Admin to book a place. AGB Table Quiz in the Old Ship on the 6th of November 2014 at 8pm. Raffle on the night with some fabulous prizes. Table of 4 is €20. Put the date in your diary now! Club AGM has been scheduled for December 5th. More details will follow. Expressions of Interest (EOI) are sought from reputable Contractors for construction work at AGB’s Ballymoney facility. For more information please see Ballymoney Construction Expressions of Interest at www.arklowgaa.com. The U8 AGB girls’ team had their last training session/ fun day on Saturday the 27th. A great morning, packed with fun and treats, was had by all. On behalf of the coaches Freddie, Liam, John and Frances, thanks to all the girls for a great year of football, thanks to the parents for bringing the girls to training and blitz games and a BIG thank you to our Ladies Committee for always supporting us, especially Naomi and Mick!! We look forward to seeing you all again next year! The AGB U12 girls will contest Bray Emmets in the ‘A’ Shield Final at 3pm in Ballinakill on Saturday the 4th of October. Best of Luck girls! These girls have worked hard all year and are guaranteed to put on a great display of football. All support welcome! Following a sluggish start to the 2014 season where victories seemed a distant ambition, the boys of the AGB U12 found their groove coming towards the last few games and produced thrilling games and fast free flowing football to delight their travelling and vociferous supporters. At the outset of the season, with a small playing contingent, AGB were struggling and finding the going pretty tough. A few heavy losses were inflicted by various teams. This was through no fault of our gallant players or the backroom team, but we badly needed an injection of recruits. Thanks to the continuing efforts of stalwarts Lar Shaw and Noel Keohane, ably assisted by Agnes Hanlon, new players were drafted in and greatly helped in turning the fortunes of the team around. As we approached the season end the hard work put into the training sessions, with Lar, Noel and Philip finding the team becoming more settled and the players relishing the games, the results started to change quite dramatically. All we lacked was a little luck. Cracking games against Rathnew and Avondale led us to Ballinakill for the league decider; a head to head with Annacurra. Though the day was bright and sunny and the playing surface perfect, a stiff wind blowing directly down the pitch would mean this would certainly be a game of two halves. Playing into the wind for the first half, the AGB backs were against the wall and heroics in defence from Christopher, Hugh, Adam, Dylan, Liam and Sean, meant that a 2-7 to 0-3 half time score was reachable on the turn around. With Ryan, Joe, Brandon, Owen, Patrick, Ryan and Brian putting the pressure on the deficit soon became just four points and AGB were flying. A goal against the run of play for Annacurra put them back in prime position and their defence superbly repelled wave after wave of AGB attacks to see them over the line by six points. The huge travelling AGB supporters applauded their heroes off the pitch, and once again a little luck had deserted us on a day when victory was within reach. That defeat meant a winner takes all last game against Avondale, on their pitch and under lights last Monday night. As always the players and supporters turned out in numbers, despite many having previous engagements and nobody who was there left Avondale disappointed. This match was a delight from start to finish, a twenty three goal thriller that was in the mix right up to the end. Once again the AGB players were tireless, skilful and honest, racking up brilliant scores, tough passages of play and making it the game of the season. Great conditions in Avondale contributed to the free scoring and hard hitting nature of the match, each and every player who played any part must be congratulated on their efforts and their honesty and will to win. In a game like this it would be impossible to pick out any stars, all involved gave everything and although Avondale lifted the cup at the end, Noel, Lar, Philip, Agnes, the supporters and the club could not have been more proud of the efforts of a group of young men who, despite a rollercoaster season and numerous setbacks, stuck to the task, didn’t take any soft options and gave their all for their jersey. They are a group going places in the future and a pleasure to have watched develop over the year. They are all to be congratulated on showing the heart and skills that will make them GAA stars of the future. The U14 Boys played in their ‘B’ Football Championship on Friday 26th September against Carnew Emmets in Carnew. The AGB boys had another great win in a very tough and close game, winning by 2 points. Well done lads! AGB U16 Ladies play in the semi-final on October 5th. Details will follow on www.arklowgaa.com and on Facebook. Kenny’s of the Harbour for sponsoring the new jerseys for County Final Day and for hosting the team so generously after both the semi final and the final. Mooney & Byrne Construction Ltd. for their generous donation towards the Senior Ladies County Final expenses. Dermot Ryan, TRTV for sponsoring the bottled water and ice packs for County Final Day. Tommy Annesley for supplying the fruit once again for the Senior Ladies County Final. To Ray Menton for his continued support of AGB Ladies. Unfortunately we did not succeed in bringing the county title to Arklow on this occasion but with the strength of our adult ladies and that of our juveniles coming through to the senior panel, we have no doubt that AGB will continue to be a force within ladies football in the county for many years to come. On behalf of the ladies, the team management and the ladies committee, we wish to express our sincere gratitude to all our sponsors and supporters for your continued encouragement of our club in all its endeavours. Well done to Eimear O’Brien of the AGB Senior Ladies who now has an All-Ireland medal under her belt after a thrilling match with Wexford against New York on Sunday the 28th. Well done Eimear! The club is very proud to have another All Ireland winner in the ranks!